In 2010 we launched our first proprietary product: the GMT035 felling grapple. Now, almost 9 years later, over 500 GMT035s, 100 GMT050s and some 900 GMTC10 quick couplers are operating across the globe! 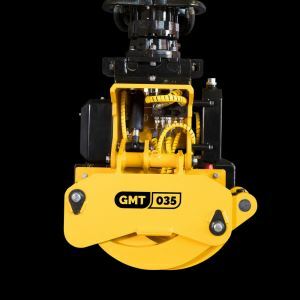 Gierkink Machine Techniek is therefore growing internationally, which is why we are transitioning to a name that is more international and easy to pronounce: GMT Equipment. GMT continues to stand for Gierkink Machine Techniek and Equipment stands for all products that leave our factory. In conjunction with this name change we are also directly introducing our new logo and corporate identity. The changes are already visible on our website and social media channels. As from 1 January 2019, we will officially be known as GMT Equipment. We are proud of our fresh, professional look that directly reflects the products we supply. In order to be able to focus fully on developing and manufacturing our successful products, we shut down our service branch for forestry machines (Gierkink Machine Service) this year.